Bishnupur is a town and a municipality in Bishnupur subdivision of Bankura District in the state of West Bengal, India. It is famous for its terracotta temples Malla Shree Krishna Raslilla and the balucheri sarees. Bishnupur was ruled under the Gupta period by local Hindu kings who paid tribute to Samudra Gupta. Following a long period of obscurity, where the land oscillated between being a minor independent principality and a vassal state. The land is also called Mallabhum after the Malla rulers of this place. The Malla rulers were Vaishnavites and built the famous terracotta temples during the 17th and 18th century at this place. The legends of Bipodtarini Devi are associated with Malla Kings of Bishnupur. 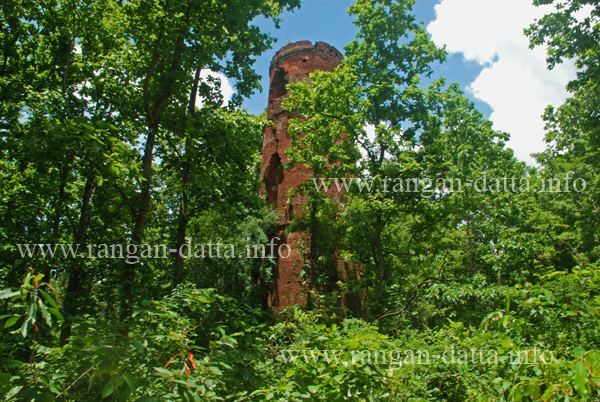 For almost a thousand years it was the capital of the Malla kings of Mallabhum, of which Bankura was a part, till their power waned during the times when Mughal Empire weakened under the last monarchs of the dynasty. The patronage of Malla king Veer Hambir and his successors Raja Raghunath Singha Dev and Bir Singha Dev made Bishnupur one of the principal centres of culture in Bengal. Most of the exquisite terracotta temples for which town is justly famous were built during this period. Mrinmoyee temple of kings is treated as a valuable historic place. 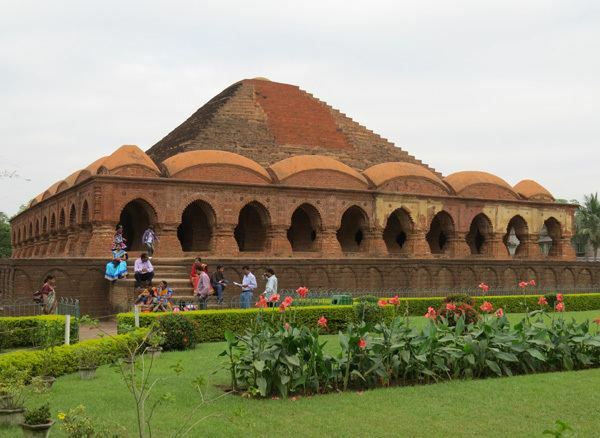 Apart from the unique architecture of the period, Bishnupur is also famous for its terracotta craft and its own Baluchari sarees made of tussar silk. Royal patronage also gave rise to Bishnupur Gharana (school) of Hindustani classical music in late 18th-century and the Bishnupur school of painting. Since 1997, the temples of Bishnupur is on UNESCO World Heritage Site's Tentative list. Bishnupur is located at 23°05′N 87°19′E. It has an average elevation of 59 metres (194 feet). As of 2001 India census, Bishnupur had a population of 61,943. Males constitute 50% of the population and females 50%. Bishnupur has an average literacy rate of 69%, higher than the national average of 59.5%; with male literacy of 77% and female literacy of 61%. 11% of the population is under 6 years of age. The headquarters of Bishnupur CD Block are located at Bishnupur. Bishnupur police station has jurisdiction over Bishnupur municipality and Bishnupur CD Block. The area covered is 365.73 km2 with a population of 138,786. 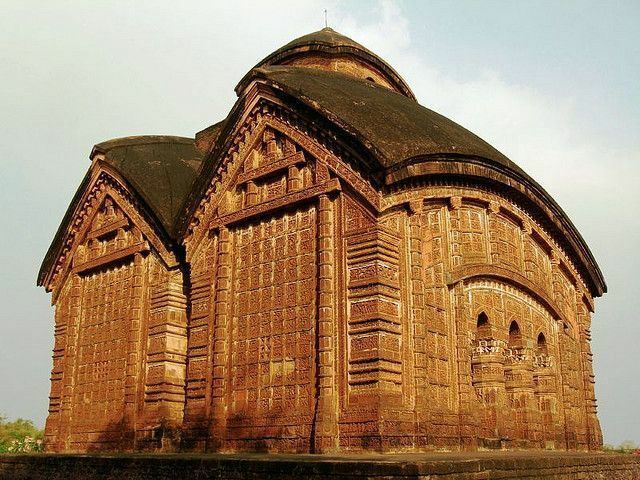 Bishnupur is a region where Bengali has gained importance. Bengali is the primary dialect although Hindi is also used occasionally. Bishnupur Krittibas Mukherjee High School. Sibdas Central Girls' High School. Bishnupur Parimal Debi Girls' High School. Kusumbani Jamundas Khemka High School. There is also an engineering college, Mallabhum Institute of Technology; a government poly-technique college named K.G. Engineering Institute; and two private polytechnic college named "Mallabhum Institute Of Polytechnic (MIP)"
Bishnupur has a 250-bedded subdivisional hospital. Radhanagar Block Public Health Centre at Radhanagar functions as the central facility in Bishnupur CD Block. Bishnupur is reasonably well connected via roads. Due to its importance as a tourism destination, it is basically connected to almost all major places of Bengal. Long distance buses connect Bishnupur to places like Arambag, Durgapur, Asansol, Kolkata etc. There are regular and frequent bus services available between Kolkata and Bishnupur. The buses usually leave Kolkata from the Espalnade bus stand. The journey takes about 4 hours and 45 minutes. Bishnupur is well-connected by rail to the rest of the country via Kharagpur and Adra. Express and mail trains ply between Kolkata and Bishnupur on a regular basis. The Rupashi Bangla Express, Aranyak Express and the Purulia Express are the most convenient trains to reach Bishnupur from Kolkata; these trains come via Kharagpur(Midnapur) and take approx 3:30 to 4:15 hours to reach Bishnupur from Kolkata. Within the city of Bishnupur, private auto-rickshaws and cycle-rickshaws are most convenient mode of communication. Recently CNG autos have been introduced plying through various parts of the town. These vehicles are environment-friendly, non-polluting, convenient, less time consuming and cheap mode of travel. Nearest International Airport is at Dumdum, Kolkata (Netaji Subhash International airport) which is 140 km away; a smaller private air strip at Panagarh belonging to the Indian Air Force is rarely used. A new airport in Andal has come up (90 km from Bishnupur). There are many such temples which stand testimony to the exquite craftsmanship of the artisans of the region. The temples were crafted from the local laterite and brick. The temples are covered with terracota tiles depicting scenes from the epic Mahabharata. 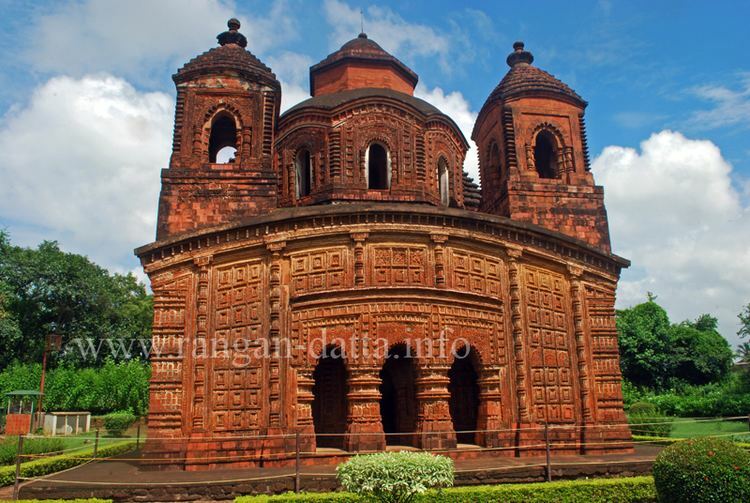 The temples are located in Bishnupur and across many other small villages in the Bankura district. A school of music, called the Bishnupur Gharana, was established here in 1370 A.D and flourished under the patronage of the Malla kings. The school hit its peak in the 16th and 17th centuries. This style of music is rooted in the Dhrupad style and is still being kept alive in local academies of music.Tabla, Sitar, Harmonium and Flute comprise the main instruments. 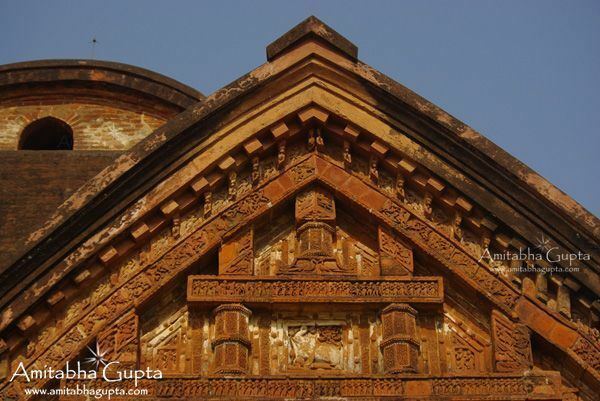 Terracotta is characteristic of Bishnupur. Apart from the temples, terracotta pottery, artifacts and even jewelry made in this very traditional material are famous. The most famous of the terracotta products are the hand made beautiful jars, disks and the more famous of them are the terracotta horses, elephants, Ganesha, and Nataraj. But nowadays the skilled artists and potters are not present and also they make different products like faces, men, wall hangings and also the mini sized Dal Madal Kaman (cannon). The potters here derive their inspiration from the glorious history of kings, soldiers, and wars. 'Dokra', one kind of metalcraft is also famous. Bishnupur is also famous for Baluchari Sari and Mallabhum Sari made of Tassar silk and was for almost a thousand years the capital of the Malla kings of Mallabhum. Woven on Jacquard punch-card looms, these sarees have episodes from the Mahabharata woven into the border and pallu. Bellmetalware, conch-shell and terracotta jewelry is also available here. The "Dashavatar Taas", kind of playing cards depicting ten avatars of Hindu god Vishnu, is drawn by hand. It is a rare artistic piece not to be found anywhere else in India. During the period 1990–2010, the 175-year-old Bishnupur Municipality was controlled by INC. From 2010 it is controlled by TMC.